Sector access interruption is a common problem in F3 series of Seagate drives. 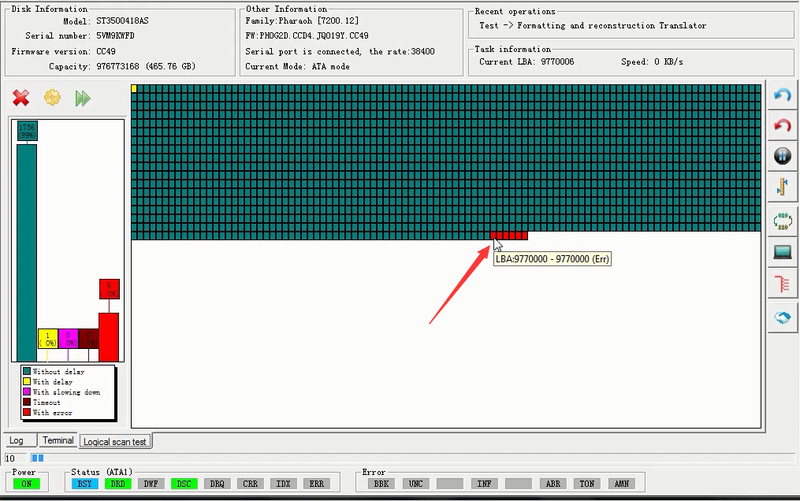 When scanning, we can normally read out the data from sector 0 to a specific sector, but from that specific sector to the end, all the sectors are unable to get the data with errors of ERR and UNC (Ie, the ERR light of device status and UNC light of error status will light up). We can confirm the problem is "sector access interruption" if one Seagate drive is with above two symptoms. In "Analysis of Seagate Sector Access Interruption", we've discussed all the contents related to Seagate sector access interruption in depth. We've known that only "dig" list can lead to sector access interruption problem, and detailed reasons which might lead to the problem can be ascribed to four: Entry missing in V40, Entry redundant in V40, Entry missing in V10 and Entry redundant in V10. And in practical work, common reasons why there are lost entries or extra entries in V40 and V10 can be summarized into three reasons: 1. there are errors within interior firmwares; 2. wrong parameters are used when recalculating translator; 3.executing G to P command in a wrong way. So in this document, we will try to create sector access interruption problems according to these possible reasons with the help of MRT Seagate utility, aiming to confirm whether these possible reasons are really able to lead to Seagate sector access interruption. 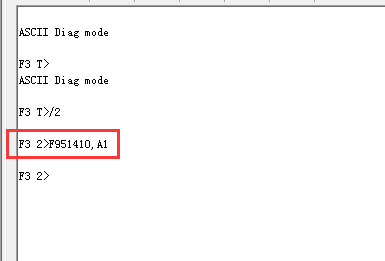 Here we will use ST3500418AS as a sample disk, which belongs to generation 12 of Seagate F3 series, to demonstrate three possible reasons that might cause sector access interruption problem in reality. 1. 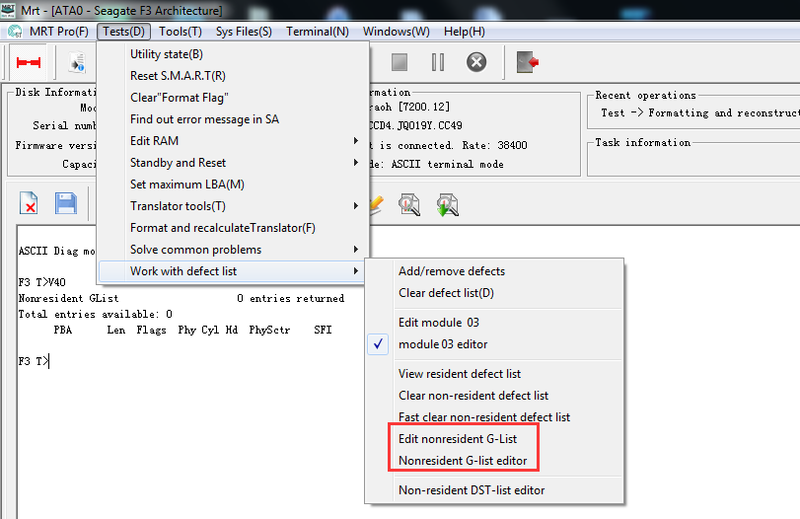 Entries redundant or missing in non-resident G-list, and use this incorrect defect list to recalculate translator. Now let's demonstrate a sector access interruption malfunction caused by entries redundant in non-resident G-list (V40 list). Last, let's recalculate the translator, and here we need to click on the option of "Process Grown Defect", click "OK" and wait for this recalculation to be done, after it is done, entries in Alt list will be transferred to non-resident G-list. We can see there is a new entry in V40 list and it is just the entry we want to add. 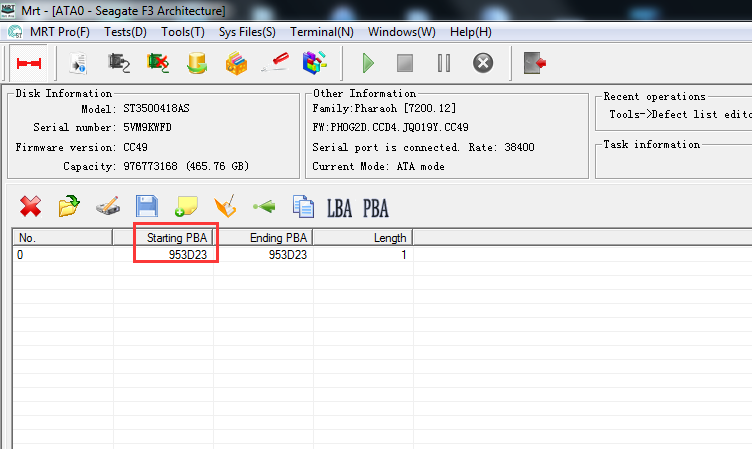 Now let's do a logical scan again, set the starting LBA of 9768243, and set the block size as 1, and we can see the scan can be normally operated to the LBA of 9769999, and from the LBA of 9770000 to the end, the scan can not be done along with ERR/UNC error. Till now, we have successfully made a man-made sector access interruption malfunction. 2. 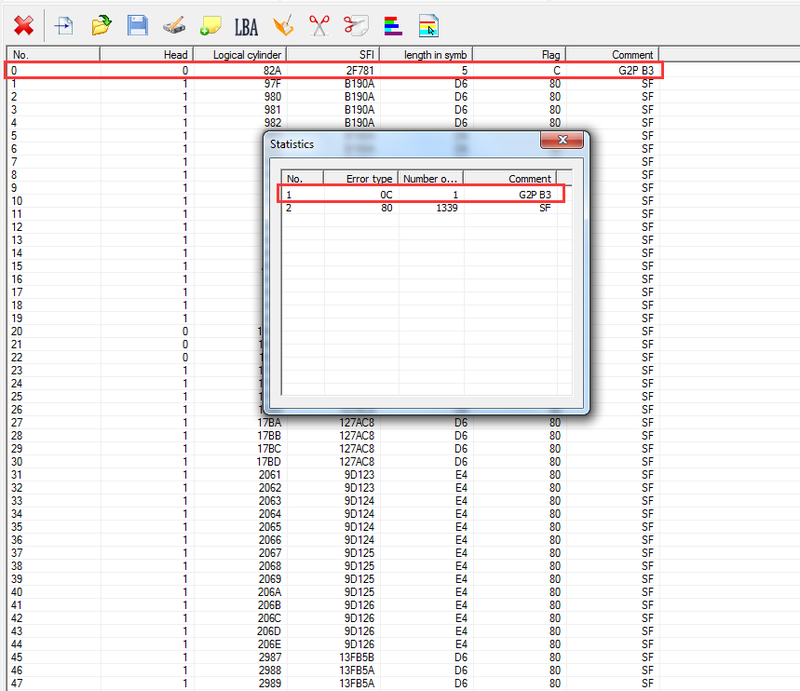 Entries redundant or missing in P-list, and use this incorrect defect list to recalculate translator. 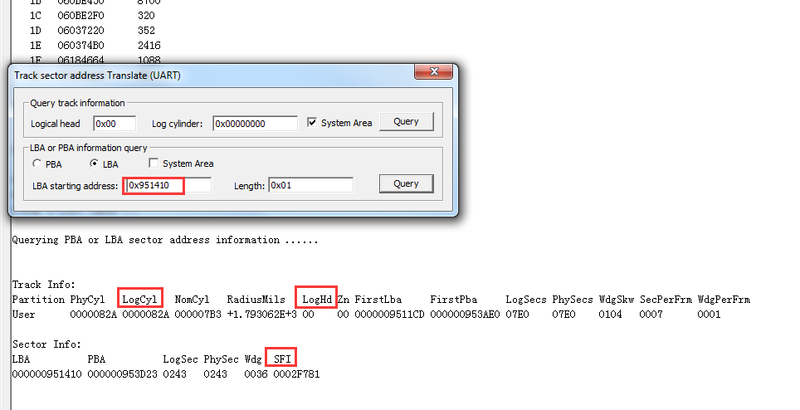 Now let's demonstrate a sector access interruption malfunction caused by entries redundant in P-list (V10 list). 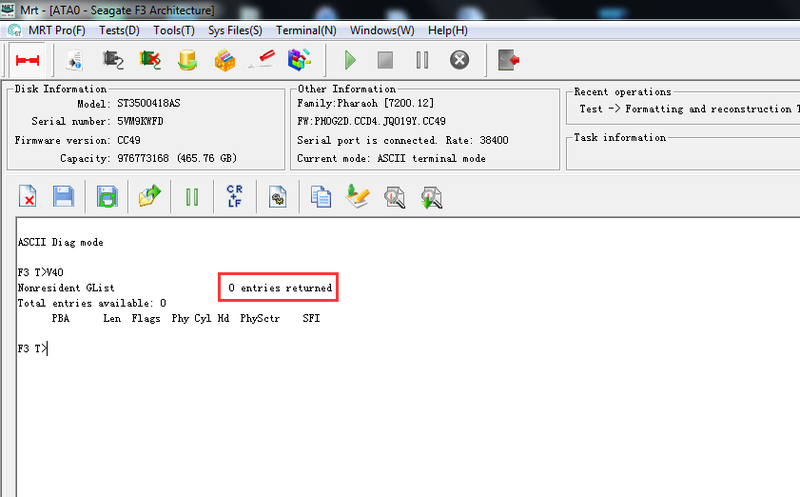 We can manually add defects in "module 03 editor". 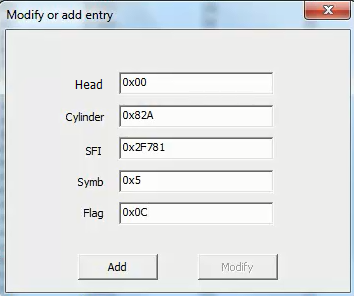 It is a little bit complicated to add defects in module 03 editor, we need to input values of "Head", "Cylinder", "SFI" and "Flag", thus we need to use "Track sector address converter". 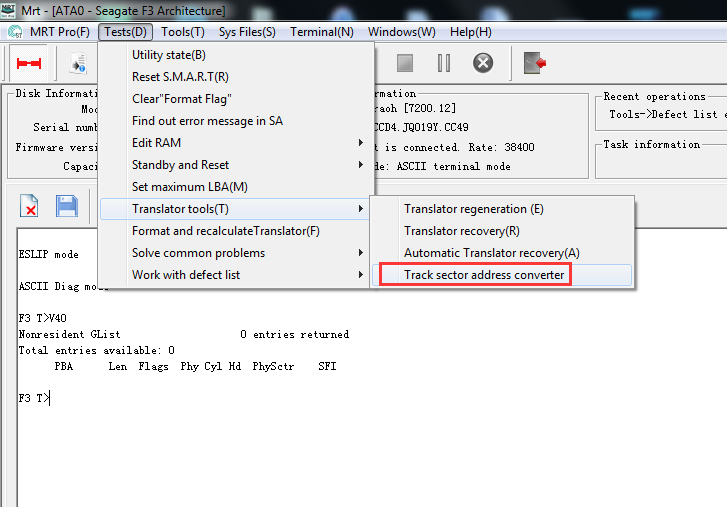 Click"Tests->Translator Tools->Track sector address converter", select LBA, and do not need to select "System Area", and we input the LBA address in hexadecimal to "LBA starting address" box, click "Query", and we will get corresponding information in log interface. We need to write down values of LogCy1, LogHd in Track Info and SFI value in Sector Info, then we back to module 03 editor, input LogHd value to the box of Head, input LogCy1 value to the box of Cylinder, input SFI value to the box of SFI, input defect length to the box of Symb (it is recommended to input the value of 3 or above 3), input error type to the box of Flag (it is recommended to input 0x0C), and finally click add option and write option, when the writing is done, we recalculate the translator, and we can also create a sector access interruption problem. 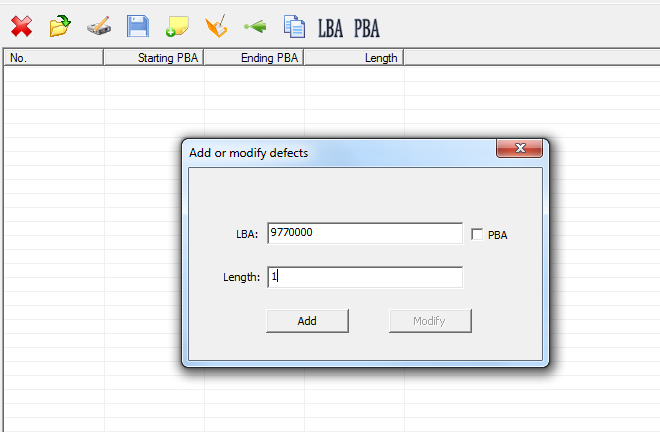 We can use "move G-list to P-list" option in MRT software to create a sector access interruption. The operation of G to P is actually moving entries from G-list to P-list, that is to add defect entries to V10 list. Usually, adding entries to P-list directly is really rare, but a lot of people might execute the operation of G to P. Here we will demonstrate how to do G to P operation. The above contents can prove entries redundant or entries missing in "dig" lists will lead to the problem of sector access interruption, that is to say, entry missing in V40, entry redundant in V40, entry missing in V10 and entry redundant in V10 are all direct reasons of Seagate sector access interruption. The above all are the contents of solutions to Seagate sector access interruption (Part One), thanks for your reading.